Oil and gas reservoirs are much more horizontally aligned than vertically. To make the most efficient use of them, they also need to be drilled horizontally. In this, "directional" drilling is used, which requires not only the rotating drill bit but also additional electromechanical actuator technology underground. Moreover, a whole series of measurement data is needed in order to carry out directional drilling reliably. MWD (measurement while drilling) systems which are placed directly behind the drilling heads collect this data and forward it to the surface using various methods. Alongside standard values such as inclination, direction or drilling speed, the composition of the surrounding rock formation can also be determined using highly sophisticated scanner systems. 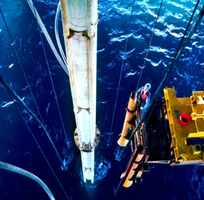 Phytron actuators are used to change the inclination of the drilling head, to position the scanners underground precisely or to switch on valve logics for communication systems, known as mud-pulse telemetry systems. 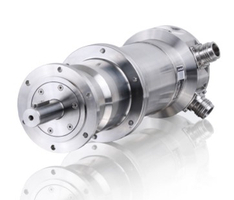 These sophisticated tasks can be carried out using Phytron's pressure-compensated and temperature-resistant stepper motors with and without gears, reliably and to the highest levels of precision. Whether the challenge is an ambient temperature of 200°, vibration loads of more than 25g (rms) or an ambient pressure of 1500bar, Phytron's stepper motors and actuators for harsh environmental conditions have been specially developed for these tough conditions. In the maintenance of offshore pipelines or the cleaning of oyster farms, seawater-resistant drives from Phytron help to move the grippers of underwater robots and ROVs reliably towards their target.